This is the true account of how God moved in the lives of Steven and Geraldine Alford, founders and trustees of The Light of the World Trust. Following a series of recorded interviews over a period of two months Beth King. I slowed down as I saw my two friends on the bike ahead of me pull over to a lay by and then I spotted a young woman at the side of the road. I watched as the three spoke briefly then my gaze followed the girl as she got back in her car. I pulled in behind the car as my friends headed off on their bikes with an empty petrol can. I walked round the white Capri which sported a black Vinyl roof, noticing that the girl was reaching down to the floor of the car for something. I sat heavily on the bonnet anticipating her look of surprise when she saw me. She immediately looked up and our eyes met, time seemed to stand still. Our eyes locked and for several minutes not a word was spoken. Then I began to feel self-conscious and embarrassed, this had never happened before. I looked away feeling a mixture of embarrassment and confusion. I know him I thought I’ve known him all my life. Then he asked my name. I had never liked my name, Geraldine so on impulse I made up a name Deana. I had to look away again when I told him my name was Deana but once I had said it I was able to look back at him and again our eyes locked. ‘What’s yours?’ I asked and he told me his name was Steve. I told Steve that I hadn’t seen him pull up with his friends and he smiled telling me that his bike was parked behind my car. Steve’s friends came back with petrol and Steve walked over to them and the three of them spoke for a few minutes then his friends drove off. We walked hand in hand through the countryside, climbed a hill and gazed down at the Herefordshire valley; we were completely at ease with each other answering the many questions about ourselves even sharing dreams for the future. I had heard of love at first sight but until then had never experienced it, I had never really believed in it. When Steve asked me, if I was married I said no, omitting to mention the fact that I had been married and was now divorced. I didn’t tell him that I had three children either deciding to see how things progressed between us. After all I thought we’ve only just met, even though I feel as if I’ve known him all my life. The sun shone brilliantly from the pastel blue April sky picking out silvery glints on the river which snaked around the basin of the valley, around tiny houses and a grey stone church. They sat against a fallen log drinking in the view and from time to time gazing each other. Geraldine thought that Steve was handsome in a rugged sort of way, he was tall, about 6 feet 2, broad shouldered and narrowed hipped. His face was manly with a strong, square jaw but there was something almost boyish about his shy smile. He had a slight squint in his right eye which put her in mind of Clint Eastwood. Glints of gold in his thick chestnut hair made Geraldine feel that she would like to paint his portrait, but she also wanted to run her fingers through his hair and fought to resist the impulse. Watching Deana’s profile as she gazed down at the valley, I thought she was very pretty, her small features accentuating her delicate bone structure. When I looked into her large dark eyes, it seemed to me that I was drowning in deep pools through which I could see her soul. Her smile lit up my heart in a way I had never known before. I noticed her trim, well-proportioned figure and slim legs, her feet encased in four-inch cream stilettos, I noticed the difficulties she had as I helped her climb the hill and smiled thinking how incongruous her shoes looked here in the heart of the English countryside. I turned to Steve and said thoughtfully. ‘Perhaps we are in heaven. I wonder if on our way here we were involved in accidents and now we are in heaven together’ but I knew that I wasn’t dreaming, that something life changing, fantastic had happened, could it be supernatural? The ambience, our feelings towards each other on this heavenly spring day, all this happening so unexpectedly made us wonder if we really were still in the world, were we? And my thoughts went back to a very strange event which occurred exactly one month ago. Geraldine had had some experience with supernatural occurrences, the most recent being one month ago to the day when she had been preparing to visit a man she had once thought she was in love with but now realised that this had only been an infatuation. His name was Michael, he was Irish and had been an accountant in a hotel. He was now on remand in prison for embezzlement, his true circumstances had been a shock when they were revealed to her and although the relationship had finished completely eight months ago, he had asked her to visit him in prison. She had done so, promising to return one month later with tobacco and paper backs but one month to the day before meeting Steve, she had been preparing to pay Michael a second visit in prison but as she stood in front of the fire place with a carrier bag containing tobacco and books with her car keys in the other hand and was just about to leave, she felt an overwhelming desire to lay down on the sofa. This surprised her because she was not feeling tired at all and was in a hurry to leave, nevertheless she walked to the sofa and lay down on her back. Almost immediately, she heard the sound of the lounge door opening then the sound of bare feet, definitely bare feet, walking across the carpet, she tried to open her eyes but found she couldn’t, yet she wasn’t the least afraid quite the opposite, she felt a tremendous sense of peace, she then felt the unmistakeable pressure of hands on her shoulders but was still not scared despite the fact she couldn’t move a muscle or talk. After a few seconds, the gentle pressure of hands on her shoulders was released and again she heard bare feet walking across the carpet and the door closing. As soon as she heard the door close, her eyes flew open and she sat up wondering what on earth had taken place. I knew that what had happened had been something supernatural, had it been a ghost? I wasn’t sure if I believed in ghosts or not, I walked through the flat checking all the rooms but knowing I wouldn’t find anything there. I went back into the lounge and sat on the sofa trying to work it out and suddenly I was given a reason for the visitation. The gentle pressure of hands on my shoulders had been telling me to stay put not to make this visit to Michael. I realised that if I had kept up the visits to Michael in prison, every 4th Thursday, I wouldn’t have met Steve. Now, being a Christian which I wasn’t at the time, I realise that the visitation could only have been from an angel. Deana and I sat chatting for a long time, perhaps a couple of hours even but from time to time she looked very thoughtful, almost worried. I asked her if she had something on her mind and she shook her head saying ‘No, nothing’. I did have something on my mind, something that I knew I should tell Steve about… I was very worried despite being blissfully happy with Steve. I hadn’t told him that I had three children from a marriage that had been very unhappy because my husband had been a violent, jealous man. I had divorced him on these grounds and had been given custody of our three children, but he had never supported them or me financially nor had he shown any desire to see his children. So as a result of this I had been finding it very difficult to pay the rent and to make ends meet. One day when my children were aged 9, 7 and 3 my parents had suggested that they had my two eldest children living with them, Monday-Friday each week and the children came back and stayed with me at weekends Friday evening to Sunday evening and every school holiday. This was such a hard decision for me to make but at the time it seemed the only way that I could manage things financially because it meant I could find someone to look after my youngest son Darren and I could get a part time job enabling me to pay the rent. I missed Tracey then aged 9 and Steven then aged 7 terribly. A Scottish ex-boyfriend Brian who I had known for about 5 years had asked me to marry him and I had reluctantly agreed because I had never loved him. The reason I had agreed was because it meant that Tracey and Steven could come back to live with me and I longed to be a family with all three children again. My thoughts came back to Steve and I had been too ashamed to tell him of all this, how could I tell him I had promised to marry someone I didn’t love purely for financial security? My thoughts kept going back to this situation and every now and then Steve would ask me if I had something on my mind but each time I just shook my head and quietly said no. Part of me longed to unburden myself to him and tell him everything but then part of me also said that I couldn’t tell him as we’d only just met. We decided to go for a pub lunch, I told Deana to look out for a landmark called The Old House on the left-hand side of the road approaching the town centre, I’ll follow on behind I said. As I drove close to it, I noticed that The Old House was quite a feature and very imposing in its Jacobean style. In a pub, over lunch, as Steve was stood at the bar, I saw his reflection in the mirror and every now and again our eyes would meet, and I would feel embarrassed that he had caught me looking at him. I wrote the name Deana on a small card adding my phone number and handed it to Steve. I was still toying with the thought that I really should have told Steve about my circumstances, but I decided I would tell him the next time we met. We left the pub and Steve sat with me in my car for a few minutes before saying good bye. Suddenly I heard a voice inside my head saying ‘you’re not going to see each other again’ which I recognised, I had heard it before when I was just 11 years old when a friend and I got into the car of a man who promised to buy us an ice cream, as we sat in the back seat waiting for the man to walk round the car to the driver’s side this same voice, gentle but very authoritative had told me to ‘get out of the car and run’. Hearing this same voice again I began sobbing because I knew it was the same voice of God I’d heard the first time; the voice had spoken with such authority. I told Steve what I had heard but he just laughed and holding me close to him reassured me again and again that he would be phoning me the following evening. As I drove off I didn’t turn to look at Steve, foolishly believing that if I did the words spoken might come true. I was confused, my head filling with superstitious nonsense. Neither Steve nor Geraldine has been able to remember their respective journeys home on that day. The following evening, I waited for Steve’s call, but it didn’t come. Something must have happened. I was sure he would phone tomorrow but again no phone call came. I had tried phoning Deana every spare moment of the day and night. I wasn’t on the phone at home but walking to a phone box didn’t trouble me. What did trouble me was that no matter how many times I called, Deana’s phone was either busy or just rang and rang. I know women like to talk but this is ridiculous, I thought. I just couldn’t understand why Steve hadn’t called. When my friends rang I had deliberately kept the calls short in case Steve was trying to get through. There had been quite a few phone calls for Brian because I had allowed him to use my phone number when he had applied for work as a self-employed electrician but most of the time the phone wasn’t busy at all. One week later, after dialling Deana’s number for the umpteenth time I felt a surge of optimism as I heard the rapid pips of the receiver being picked up. A male voice said hello and I asked if I could speak to Deana. ‘There’s no one of that name on this number’ the voice with a broad Scottish accent said and I heard another click as the receiver was replaced. From the kitchen I heard my phone ring and as always rushed from the kitchen to the living room, just in time to hear Brian say there’s no one of that name on this number and hang up. Who was that? I asked tremulously, fearing the worst. ‘Just some guy asking for Deana’ Brian said, ‘I told him there’s no one of that name here’. I thought why, oh why did he have to pick this evening of all evenings to come around and pick up his phone messages? The following Thursday, exactly one week to the day, Brian again called to collect his phone messages. Once again, I was in the kitchen cooking dinner for Darren when the phone began to ring. I couldn’t rush to the phone because I was holding a hot dish of spicy lamb casserole and was frantically trying to make space for it on the worktop when Brian walked into the kitchen, ‘It’s the same guy again’ he said, ‘I keep telling him there’s no one called Deana on this number’. I gave him a stony glare and through gritted teeth told him to never, ever answer my phone again. I was incredulous and deeply disappointed. Two Thursday’s running, Steve had phoned me, and the same thing had happened. Now at that time Geraldine who had never believed in the theory of evolution but did believe in the Creator, God although she couldn’t even begin to picture or image what He was like. Much, much later she learned that Jesus had said ‘No one comes to the Father except by me’ and ‘if you have seen me you have seen the Father’ but in those days Geraldine knew very little about Jesus and knew nothing about having a personal relationship with Him. Steve believed in the power of good and the power of evil, knowing them as God and Satan but he knew nothing about having a personal relationship with Jesus either. I had been telling my five-year-old son, Darren a story when the phone started ringing. I leapt across the room lifted the receiver and was just about to say hello when Darren’s voice rang out ‘Mummy, finish telling me the story’. ‘Just a moment sweetheart’, I replied before saying into the phone, ‘Hello’, there was no answer. ‘Hello.’ I said again and was just about to say Steve, is that you? Then all I heard was the click as the phone was hanged up. Replacing the receiver, I walked slowly back to the sofa. I heard a child call out as the phone was answered. It was Deana. It seemed that all my fears were true, and the opinion of others was correct, she was probably married to the Scottish guy who had answered before and she probably had children. This was the first and last time that I had vandalized a phone box, I yanked the phone out and threw it on the floor angrily telling myself that I had been a fool, I drank myself into a stupor that night. I sat on the sofa feeling numb knowing that Steve would never phone me again. I knew that it had been him, had known it from the moment I had picked up the phone and now it was too late. The voice who had spoken to me in the car “you are not going to see each other again’ had been speaking the truth. If only I had taken Steve’s address, I would be able to contact him. I couldn’t bear the thought of never seeing him again, not being with him with, not sharing our lives together. However, I knew that I had to be strong for the sake of my children and my sanity and the only way I could do this was to try to forget Steve, to develop a mental block. Later on that same year, Bol, the chief of the bikers had reason to go to Reading, half a dozen of us decided to go with him. In some ways it was the worse run of my life. Bol did his business and over food and drinks at the services Trim, another of the gang drew my attention to the car park which was visible through the doorway. I followed his pointing finger and my stomach seemed to drop…There was Deana just getting in to her Capri. She wasn’t alone however…It looked as though she had brought her family with her, three kids and a tall bloke. He was waiting on the passenger side. I told Trim that I was off and to tell Bol because it was his bike I had borrowed for the run. Grabbing my brain bucket [crash helmet] gloves and ran out of the building, I realised that I would not reach them before they had driven off because they were closer to the exit than I was. I got on the bike and heard the purring as the Capri disappeared through the short tunnel. This meant that she was heading out of Reading although I had no idea where she was going so going faster than I should have, I roared out of the car park and persued her. As I joined the motorway I could see the black vinyl roof of the Capri about five cars in front. After some time, it was obvious that she was heading for London, I closed the gap between us but there were still three cars separating us. She moved in to the right-hand lane and I mirrored the movement. As I moved up closer, the Capri indicator flashed again, I followed suit and soon there was only one car to pass. Checking that it was clear behind I drop in to the middle lane and accelerated but unbeknown to me a car had pulled out of the slow lane and was very nearly eating my exhaust. At the sound of the horn I glanced behind me and was quite surprised at the closeness. At that moment Deana must have turned off the motorway and the chase nearly came to an end there and then. I managed to find and follow the Capri on to a major road, but she had built up quite a lead on me. Despite what I did, flashing the light, sounding the horn and even waving the Capri kept its lead. I had to stay close to the Capri for I had no idea where she was heading. At one point I was close enough to see three kids sitting on the back seat and one of them was looking straight at me I tried hand signals to pull over…I know the kid saw me because the white blur of his face disappeared as he spoke to the other occupants, but the car never slowed. Then I spotted three faces peering out of the back window. The Capri turned a sharp left by the time I followed around the turn I just caught the last couple of feet of its white body as it spun another sharp left…I scrambled around bends left and right but on one of these turns I lost sight of the Capri altogether and did not see it again. I continued for some time taking random turns but no joy she had disappeared. Once back in Madeley, I tried to get on with my life, but I was never able to forget Deana, I had other girlfriends, but it was not the same, none of them meant as much to me as Deana and I didn’t feel anywhere as close to them as I had felt with Deana. In 1975, two years after that unforgettable day in Hereford, the day that Deana and I had first met, I began experiencing problems with my one good eye. I hadn’t mentioned to Deana that I had lost my sight in one eye when I was only two, I had forgotten and anyway it simply hadn’t seemed necessary. My vision in my one good eye was rapidly deteriorating and after a consultation with my consultant, I underwent surgery to correct a detached retina, but the surgery was unsuccessful, in fact matters became worse as my sight rapidly begun to fail. I was now totally blind. My mother had lost her sight when I was only 8 years old and it was thought that the condition was hereditary. Initially I had no idea what I was going to do with my life. Having military blood in my family, I had wanted to be a soldier for as long as I could remember but I knew that being blind in one eye I would be rejected by the army and now with the blow of being totally blind, what on earth was I supposed to do with my life? The worst thing about being blind I thought was just being stuck in one place and not being able to go out without holding onto someone’s arm. I began long cane training and although I hated being so conspicuous with a white stick, at least I was able to go out independently. Three months later, I was in the RNIB rehab centre, Torquay where I learnt to type to a high standard and in general look after myself. I went from Torquay to Letchworth where I successfully completed the course in light engineering skills and was able to operate lathe mills and bench mounted industrial drills. Later I was able to find employment in this field by joining the staff at a disabled skills centre. During these years, my feelings and emotions towards women were mixed. I hadn’t been able to forget Deana, I kept remembering the way she had looked at me with those large dark eyes, there had been no deceit in those eyes at least, that’s what I had thought at the time. My moods fluctuated, at times I knew she was the only woman for me but there were also times when I almost hated her. I was never short of girlfriends but there was something in me now that made me distrust all women and I decided never to let a woman get under my skin again. I didn’t really find this a problem because there was so many other things in life that I was interested in, probably the most important being the meaning of life. I began the long road in my search for the truth through Darwin and his theory of evolution, philosophy, cabalism, and then to the occult. Through the occult, I learnt of many things which later I wished I hadn’t and one of my girlfriends became addicted to heroin through her fondness on this path. I began doing personal Tarot card readings for friends, but I did this freely without a charge. I was still searching for the truth. Just three months after Steve and I had met, I married Brian, but I knew even before this happened that the marriage would not last. I had my three children living with me again and after eleven months of marriage I decided to tell Brian the real reason, the only reason, I had married him which was purely for financial security. Ironically, after we married there was no financial security because Brian spent his wages on several bottles of whisky each week and gave me very little money to pay the rent and buy food, so I was back in the same financial insecurity again. I had decided to start a publishing business, initially publishing magazines for hospital staff social clubs and within a very short time I was able to employ reps who would sell adverts to cover the costs needed to print the magazines. My publishing business became very successful very quickly and I had met Paul shortly after this. I was divorced from Brian and I found Paul who was half German to be a very caring guy, he was also good to the children, so we were married in July 1975. She was very fond of Paul, but love was out of the question because she had given her heart to Steve and she thought that fondness was a strong enough basis for marriage. I was reasonably happy with Paul but found it to be a materialistic happiness. We never discussed the deep things of life as Steve and I had done during those precious hours we were together but instead spoke about having an extension to the back of the house and I in my mind would picture how the extra rooms could be decorated and furnished. We took the children to Spain, their second visit and later we were to honeymoon in different parts of America ending in Mexico City. There began to be problems with Paul and my children, mainly my daughter Tracey who by then was just 15, it seemed that there were arguments every day and my nerves were wearing thin. My publishing business which I had started the year before was doing very well and I took solace at the office every day to escape from the seemingly ongoing quarrels at home. I knew that Tracey was at a very difficult age, she was going through a rebellious period and I also knew that Paul had never had been married before or had any experience with children. Now with things getting steadily worse in her marriage to Paul, she realized that a separation, at least until the children were grown up, might be the only solution. Her publishing business had become successful and she was offered a mortgage in her sole name on a detached four bedroom house in a highly sought after part of Eastcote, this being only a few minutes’ drive from her office she hadn’t really decided whether to leave Paul or not but at least another house would be a place where she and the children could live and Paul could visit whenever he wanted. Three weeks later I learnt that contracts had been exchanged and I moved into the new house with my children. The children were then aged 16, 14 and 10. My eldest Tracey left school to stay home and look after me, all my children must have been traumatized by my accident. The tranquilizers and other medication that I was still being prescribed began to get their grip on me but for two weeks I continued to go to the office by cab. Within a short space of time I began to feel redundant at the office and found it hard to keep my eyes open and stay awake because of the medication I was on. Publishing needed sight not only to proof read and edit, it seemed that publishing needed sight for everything. All I could do in the office was use a Dictaphone to record phone numbers which needed to be read to me and this took so much time, it was simply not cost effective and soon the benzodiazepine tranquilizers made me groggy, sleepy but as time went on my medication instead of being decreased was increased with repeat prescriptions. There were a few perfunctory visits by social workers, but long cane training and rehabilitation were never suggested. In the first four years after the accident, Paul continued to visit me, but this was usually not until almost midnight when he had finished drinking after leaving his office. He would often bring me bottles of wine or cider I didn’t know at the time that alcohol exacerbates the effects of benzodiazepines and he and I would sit up talking and drinking until the oblivion of sleep took over. Paul finally left four and a half years after the accident, Tracey and Steven had also begun drinking and using cannabis, but I was not aware of this until much later because of the effect of the tranquilizers. My parents arranged for me to go to a rehabilitation centre at Torquay, but the tranquillizers had increased my levels of anxiety to six times higher than normal. After just 3 weeks at Torquay, I was a nervous wreck, afraid of everything and decided to go back home to be with my children. Of course, I hadn’t known that Steve had also been at Torquay for rehabilitation and long cane training only a couple of years earlier, how strange that once again our paths had crossed. When Tracey was 22, Steven 20 and Darren 16, my parents took me back to their home for the weekend. They also took a pile of unopened mail that they had discovered in my home and learnt to their horror that the bank was threatening to foreclose on my home because of an unpaid secure loan on the property, I had no recollection of taking out this loan, but facts are facts. Unless the secured loan was repaid in full, I would lose my home. There was no other way I could do this; the house had to be sold. At this point my mother took over dealing with all aspects of my finances; I was zonked out most of the time. Tracey and Steven found a flat together and Darren who was then 16 didn’t want to move to my parents’ house in another part of London, away from his brother and sister and friends so was looked after by a school friend’s parents until he was 18. I missed my children terribly and became very depressed. In December 1984, 6 years after my accident I moved with my parents to Bristol, I was glad to move away from the home where my teenage years had been so unhappy, but Bristol was so far from my children, when would I see them again? My new GP increased my medication and I began having fits. I was referred to a psychiatrist who decided on a one-year program of withdrawal of the benzodiazepine tranquilizers and sleeping pills I was addicted to. By then my daily dosage of medication was equivalent to 220mg of Valium. As my medication decreased by 10mg each month I had fits with each reduction but gradually I became more alert but with this renewed alertness, I also became more aware of my predicament and my many loses. Through my mother making enquires with the local church, firm friendships began to grow between myself and Christians who visited me at home. I wanted to know how and when they had become Christians and their answers fascinated me. They began to share scriptures with me and two of them Lyn and Pauline recorded many of these on cassette. They had something that I wanted, joy and an inner peace. A curate from the local parish church, Alex Welby invited me to his home where he and his wife Jane shared the gospel. I had also for the last year been listening to bible study cassettes by various teachers and found them insightful and fascinating. I wanted to believe, I was aware of the joy and peace in Alex and Jane and other Christian friends but the Immaculate Conception and the resurrection, they just seemed like part of a fairy tale. How could I possibly believe in those things, they were both physical impossibilities? Then one evening, standing before a picture in my bedroom, a picture I couldn’t see but one that had been described to me in minute detail The Light of the World by Holman Hunt, I thought of the scripture that had inspired the artist. As I stood there I remembered Alex had told me that faith was a gift from God, the supernatural gift, one that could not be purchased must be sought from God who gives the gift of faith freely. I remembered what Alex had told me about repentance and the desire to receive Jesus by asking Him to come in and to learn of his unconditional love. I slowly walked back to my bed and dropping to my knees I repented, remembering all my sins and tears of shame run down my face as I thought of all the people I had hurt in my life. I asked Jesus to forgive me and told Him that I simply couldn’t believe in the immaculate conception or the resurrection and to help me with this, to make me a child of God and to come into my life and to fill me with His Holy Spirit. That night for the first time in years, I slept soundly and deeply for a full eight hours and woke in the morning to a new realization. Something supernatural had happened inside me whilst I slept. Overnight, my cynicism and doubt had gone and now I believed, I knew that I knew that it was all true, the immaculate conception, the resurrection, these were simple truths which so many people including myself had been unable to simply grasp because we were applying human wisdom instead of spiritual wisdom which is obtained only having been given the gift of faith. Jesus had answered my prayers and given me the gift of faith that I had asked for. It was all true; I almost had to pinch myself trying to understand it. The story of Bethlehem, the birth of Jesus, the shepherds, the kings had really happened 2000 years ago. I had always believed that Jesus had been crucified and now I knew why He had to die - to save us from our sins. I had no trouble in believing in His resurrection, my heart was at peace. I was amazed that I could be changed in so short a time, so immediately, so unexpectedly. It was my spirit of course that had changed, changed from being full of cynicism and doubt and all because God had put into my spirit the divine gift of faith. This gift was life changing to me as it is to every person who receives it. I didn’t fully comprehend it at the time but later I learnt that what had caused this life changing gift of faith was that the Holy Spirit had come to live in me alongside my spirit. ‘Therefore, if anyone is in Christ, he is a new creation. The old things have passed away; behold, the new has come into being’. Just as the bible had prophesied. I can’t even begin to explain the joy that was in me, my depression had lifted, I really was a new creation in Christ. By March 1986, the withdrawal program was complete, and I knew that the Lord had given me His strength to endure the withdrawals without needing to go into hospital for detox. Within a few months, I learnt to cook, use a washing machine and microwave; I learnt to sew and later was even able to use a sewing machine and make curtains. I knew that I couldn’t have done any of these things as a blind person without the Lord but as the sedative effect of the medication had begun to wear off I also became acutely aware of my loses not just my sight but my children, my home, my career, my four poodles for which new homes had been found. I begged the Lord for His mercy on me, to lift me up because I didn’t want to suffer depression again, to give me strength, to lead me to a man who loved me as much as I loved him. I told the Lord that I wanted to be married and have my own home again near my children who were still living in London and I remembered the scripture. ‘Delight in the Lord and He will give you the desires of your heart’. Psalm 37 v 4. I was having a Braille lesson when my teacher told me about Sound Around, a cassette magazine for blind people. I took a copy home and after listening to it decided to record a spot-on Sound Around’s pen pal section. I felt I needed to make friends with other blind people, to ask them questions about how they spent their lives. Soon I began receiving phone calls from blind men and women who had heard my request on Sound around and then one day I had a phone call from someone who gave his name as Steve. Steve told me that he lived in Shropshire and that he had been totally blind since 1975. I immediately liked him, liked his quiet, slightly hesitant way of talking. Soon Steve and I were talking on the phone every evening, sometimes into the early hours and I became as addicted to Steve as I had been to the benzos but sometimes when we talked an image would flash into my mind, an image of myself sitting at a table in a country pub, a large window behind me and the back view of a tall man standing at the bar. I saw his reflection in a mirror behind the bar and every now and again our eyes would meet and I would feel embarrassed that he had caught me looking at him. How strange I thought why is it that this image flashes into my mind whenever Steve is talking to me on the phone? I had forgotten about the Steve I had met in Herefordshire; the tranquilizers had done their job very efficiently and in addition I had done my upmost to block Steve from my mind or tried too. One evening, as I was propped up in bed listening to music and expecting Steve’s phone call, I saw a small child standing at the end of my bed. I immediately mistook her for my niece Amy because she, her 8-year-old brother and their parents (my brother and sister in law) were spending Christmas with us in Bristol. The child had blonde hair styled in a bob, wore a long white night gown and was so pretty that I couldn’t take my eyes off her. Although this sounds strange, it didn’t occur to me at the time I couldn’t possibly have seen the child or anything else for that matter because of my blindness. The child was looking at me and smiling and I smiled back. Seeing the small child standing at the end of my bed seemed so natural, so real and at the time it didn’t enter my mind that I was seeing the child through spiritual eyes. I guessed the child to be about 6 years old about the same age as Amy, my brother’s little girl. Calling her Amy, I asked her what the matter was, couldn’t she sleep? Still smiling, she just stood there looking at me and I asked her to come around to the side of the bed because I wanted to give her a cuddle. She walked round to the side of the bed but stood about five feet away from me, too far for me to reach out and touch her. She didn’t say a word but was just looking at me and smiling. I gently told her to go back to bed to get some sleep and I watched her as she walked across the room towards the door and then simply disappear. My bedroom door had been closed all the time from, the moment I had entered the room and when I checked, it was still closed. The following morning at breakfast, I told my brother and his wife that Amy had come into my room the night before and they had said that this was highly unlikely as she slept very soundly. I told them that Amy was wearing a long white nightie and Chris’s wife Liz told me that Amy never wore nighties only pyjamas which she called jimjams. I was sure that Chris and Liz must have thought that I had gone stark, raving crazy. It wasn’t until a couple of days later that it finally dawned on me what had happened and this had been the second time I had had a visitation. I knew I hadn’t seen a ghost; the bible makes it clear that the dead do not come back into this world, but I was puzzled because in every account of angels, in the bible, angels were always male adults. So why had God sent me an angel in the guise of a small child? Then I understood that the Lord is gentle and sensitive to our disposition and our needs. He only gives us what He knows we can handle at any specified time.The Lord is wonderful; He cares for us so much. The purpose of the visitation? Well I have given this a great deal of thought and since the small child/angel didn’t speak a word but merely smiled at me, in context with what had recently happened in my life, Steve and I declaring our love for each other just the night before, I believe that the purpose of the visitation was to confirm to me that God had indeed answered my prayer and that He too was very happy with our situation.What I didn’t know at the time was that my angel smiling face also conveyed, a mystery, a secret that hadn’t yet been revealed to me and it wasn’t to be until some years later that I was to learn what that secret was. In March the following year with Steve’s encouragement, I completed my guide dog training and Wenna; my beautiful golden retriever guide dog became a part of my life. Steve had just completed his training for a second guide dog, Quanta and when he moved to Bristol shortly after this; Wenna guided me to the 5th bench in the park as previously arranged where Steve sat with Quanta, waiting for me. Steve and I held hands as we walked through the park, listening to our guide dogs tearing about as they chased each other on the grass. Steve was wearing a short-sleeved t-shirt and as I traced my fingers up and down his arm, I felt something akin to familiarity. His height, his build, his hair, his voice…. all of these seemed familiar. I had a pretty good idea why there was a familiarity between us but wasn’t sure and I had to be sure before I could say anything. 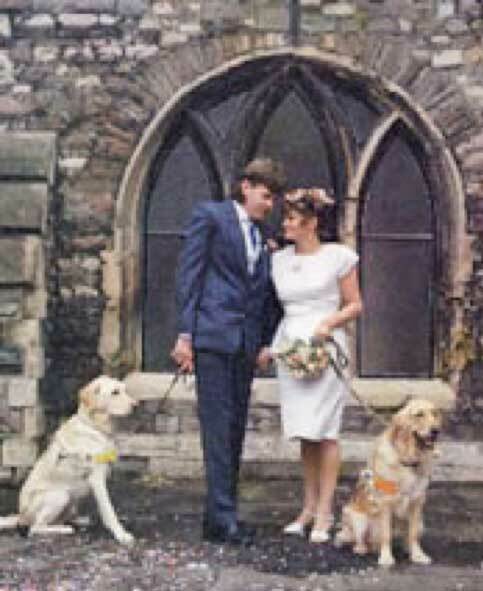 They were married a few months later, their guide dogs being given the credit on local TV and the national press for bringing them together at the 5th bench in the park but Geraldine knew that it was God not their guide dogs who had brought them together and soon Steve began to share her belief. She still hadn’t remembered the Steve she had spent those precious hours with in 1973, that was yet to come! Steve had been searching for the truth, why are we here, what is the purpose of our existence, for many years and once, before they had met and during one of their lengthily telephone conversations he had asked Geraldine if she would like a tarot card reading from him. Geraldine had told him that she was a Christian and therefore wanted nothing to do with anything of the occult. That night I threw away my tarot cards and had decided that I wanted to know more about Jesus Christ and four years after our marriage, I gave my life to the Lord. Like Geraldine I had been convicted by the gospel of John. This was the truth I had been searching for. ‘For God so loved the world that He gave His only begotten Son, that whoever believes in Him should not perish but have everlasting life.’ John 3:16. As time went by I began asking Geraldine specific questions, had she ever been to Herefordshire, had she ever owned a white Capri? Geraldine couldn’t remember ever going to Hereford, but she did remember having once owned a white Capri and asked me why I wanted to know. I’ll tell you one day I promised but the time is not right, yet. She had been suffering from severe withdrawal symptoms and in June the same month as we married, Geraldine had been diagnosed with ME and as well as suffering from severe fatigue, she still had very bad memory problems and I had learnt enough about this illness to know that it would be wrong of me to put pressure on her until she was well enough to think clearly. She was certainly far too ill, now suffering from fatigue, muscle pain, exhaustion and what she needed more than anything during this time was as much sleep as possible. Two years after our marriage, Steve and I moved from Bristol to Hillingdon in London into a house with a very large garden, a house that was only a mile from each of my three children. The Lord had answered all my prayers, how could I ever thank Him? One Saturday morning my youngest son Darren called round bringing with him a tray he had brought for me from a car boot sale. 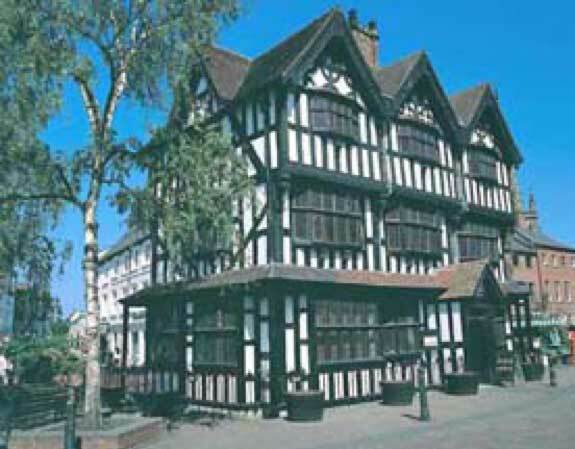 Darren said there was a picture on it called The Old House in Hereford and suddenly bells started ringing for me. Before Darren could begin describing the picture of The Old House, I began describing it to him, describing its Jacobean style, its leaded windows and everything else I could remember about it, saying I know the Old House, I remember seeing it once. This was just the sort of moment I had been waiting for and I walked over to Geraldine and whispered to her I knew it was you. When Darren had gone Geraldine began asking me questions, one question after another and slowly her damaged and fragmented memory began to fit together, just like a jigsaw puzzle. It was slow at first but then it all came back in a rush and I stared at Steve my mouth open in complete amazement. It was surreal, and I felt as if I had just stepped into the twilight zone, was this really happening? Was it really Steve, the Steve I had met all those years ago in Hereford, the day I had run out of petrol. I can’t even begin to describe the weird and wonderful things that were happening to my memory and I suppose it must be like this for anyone who has had memory problems. Is it really you? I asked Steve, I just can’t believe it. As they held each other closely, they both knew that the Lord had done this wonderful, miraculous thing; He had been working behind the scenes the whole time. ‘When did you know it was me’ I asked. From the moment I first heard your voice on sound around, I mumbled into her ear, she took a step back from me, why didn’t you tell me? She asked. I smiled and pulling her close said ‘Suppose I had, and it had turned out to be someone else, not you?’ I paused you’d never have let me live it down and I would have been nagged for the rest of my life. 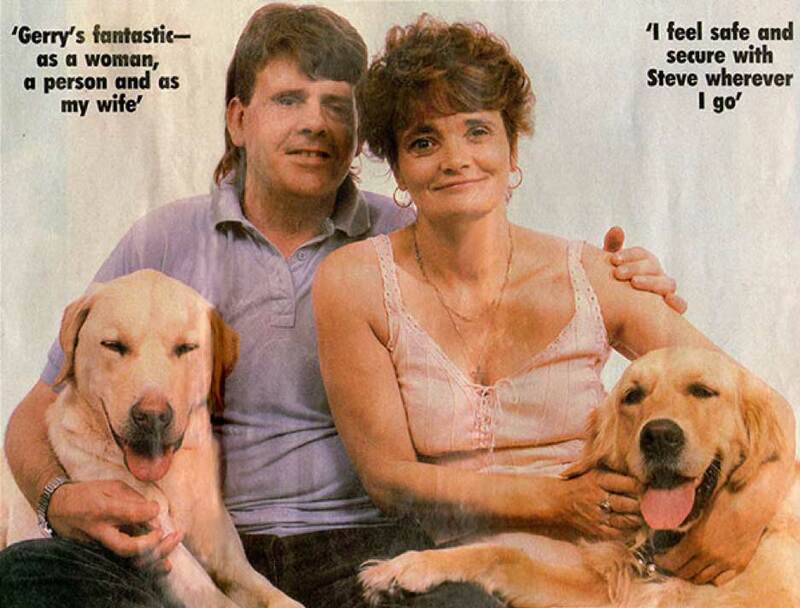 In the summer of 1993, Steve and Geraldine learnt of the truly amazing fact that they had met before, 20 years earlier in 1973 and fallen in love at first sight and that God had brought them together again. 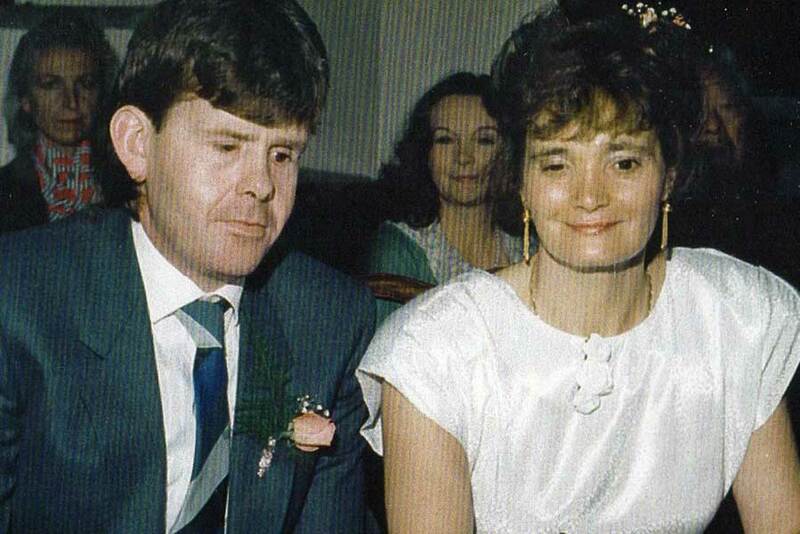 Although Steve had strongly suspected all along, they had been married for five years before it was confirmed to him and before it was restored to Geraldine’s memory. Geraldine already being a Christian and Steve having come to faith the previous year knew that this was not a coincidence. When Steve had first began suspecting that Geraldine was really Deana and as time went on this suspicion grew stronger and stronger, not being a Christian at the time, Steve felt that if Geraldine was Deana, it was an amazing coincidence. I began considering all the odds against something like this happening. The fact that when we first met, Deana had 20:20 vision and I was blind only in one eye. I began investigating specific facts. In the UK, there are about 360000 people (out of 6410000) who are registered blind and of that number only 4% are totally blind. This really blew me away because the odds of two sighted people within a space of 13 years both becoming totally blind and meeting again were astronomical. Then there was the fact that the first time we had met in Hereford, I had been living in Shropshire and Geraldine had been living in London, but these facts changed slightly at our reunion because by then Geraldine was living in Bristol. The period since first suspecting that Geraldine was Deana and it finally being confirmed was 7 years and for 6 of those years, I had believed that if this was the case, it could be nothing but a huge coincidence, but this didn’t sit well with me. The previous year, after months of searching for the truth and then reading the Gospel of St John, I knew that God must have played a part in it. I know that Jesus Christ is the Son of God. He created the universe and everything in it and one has only to look at creation to know that we couldn’t possibly have evolved. It’s a funny thing but when a miracle happens in our lives, we tend to think why me? God, our creator, the omniscient, omnipresent creator of the universe and everything in it could surely not take an interest in our lives for we must be like ants to Him. Yet the Bible is full of accounts of people whose lives have been touched and greatly changed by God. ‘When I consider Your heavens, the work of Your fingers, The moon and the stars, which You have ordained, What is man that You are mindful of him,’ Psalm 8:3. I had heard accounts of coincidences and déjà vu experiences, but I instinctively knew that this was neither, that this was truly a miracle, one of the poets; I think its Tennyson said “God moves in mysterious ways, His wonders to perform.” God had ensured that confirmation of His miracle was not confirmed to us until we were both Christians and we know that if we had not become Christians we would have put it down to be a tremendous coincidence. ‘We know better than that now, we know that with God, all things are possible’. Of course, Steve and I have discussed this on many occasions over the years, at first I used to tease Steve about not phoning me, the day after our first meeting but deep down I know that Steve did try to phone me and he knows that I expected and waited for his call but now I think we both believe that God divinely intervened and in so doing prevented us having any further contact with each other until the time was right. We both had to be totally blind within the very small section of people in the UK who are registered blind for us to meet again and then first I and later Steve had to become Christians. God can take the most difficult and tragic circumstances and turn them around, sometimes using other people to play apart in this turn around and two examples of this are how He used my braille teacher who first gave me the Sound Around cassette and another is how He used my son Darren in bringing a tray with a picture of the old house on the front of it to help bring back my memory. Romans 8: states “For we know that all things work together for good for those who love the Lord, for those who are the called according to His purpose”. Throughout our Christian lives together, Steve and I have found that God really does answer our prayers and He has given us evidence of this throughout our marriage. Yes, the Lord loves and cares for us all very much, but this doesn’t mean to say that when we become Christians our lives no longer have any problems. We all have problems in our lives but none that God can’t help with. I would strongly encourage anyone who doesn’t know God, the Father, God the Son and God the Holy Spirit, the triune God, our Creator, to give deep thought to this, read the Gospel of St John, this gospel possibly more than any other gospel points the way to the truth and then when having discovered the truth, repent of your sins and give your life to Jesus. “I am the way, the truth and the life; no one comes to the Father but by Me” John 14:6. In the midst of my depression, the Lord heard me call upon Him and responded in an amazing way, He changed my life, completely turned it around so to anyone who may be reading this who suffers from depression, remember that God is awesome, He can change your life and turn it around for you too, all you have to do is call upon Him. In 2002, when we had been married for 14 years, the Lord laid it upon our hearts to set up a charity and He gave us the name to use for this charity, The Light of the World Trust. 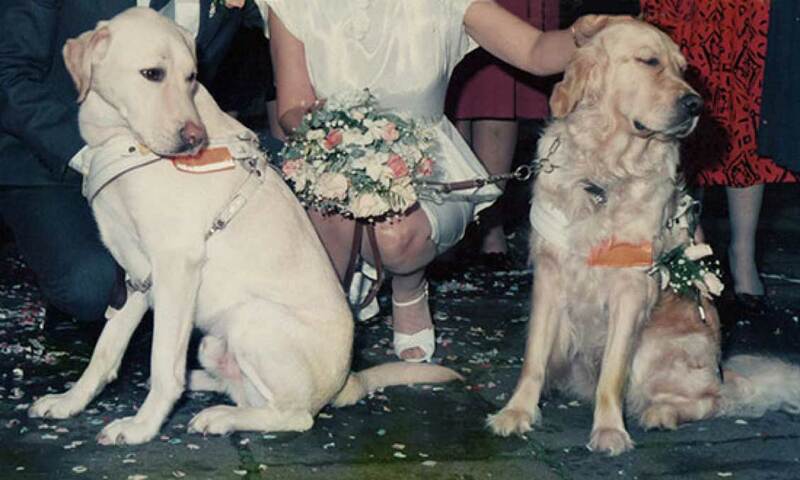 Since losing our guide dogs, Wenna in 1998 and Quanta in 2000 after discussing the matter and Steve had had a heart attack I was still recovering slowly from ME both being unable to train for new guide dogs, we introduced two pet dogs to our family and have had pet dogs ever since. By God’s providence, we have always been able to afford a dog walker to walk our pet dogs, but it made us think of elderly and disabled people who had pet dogs but were unable to walk them due to their general health or disability and were unable to pay the high costs of using a professional dog walker. Our main project is to provide a free dog walking service to elderly and disabled people who love their dogs but have no one to walk them. We charge a small registration fee, just to cover our overheads but the dog walking service is completely free of charge to elderly and disabled people since we use volunteers who are very carefully referenced to become dog walkers. The project is very successful and whenever we match up a volunteer with one of our service users, we know that glory has been given to the Lord. Amen.